Not having read the first in the series, it took a moment to acclimate to the people that comprise this story: a bit of a trick as there are four points of view telling the story: Prudence, Seth, Earl and Sara. Beginning with Prudence – she is the center around which the story begins: the person who brought the group together at the farm she inherited on Vancouver Island. Fast becoming the ‘foodie” destination with farm to table opportunities at their zenith – Prudence not only wants to make Woefield Poultry Collective a growing concern, but she hopes to make the world, and the people she encounters, discover a bit of goodness and kindness in all things. A bit mired in her own good intentions – she’s wonderfully earnest and good-intentioned, and not easily daunted. Fortunately she also inherited someone with knowledge of the farm and farming in Earl. Earl’s no-nonsense approach to the world, and his seeming endless patience with the oft-frenetic (if good natured) energy of Prudence is adorable. He’s the ‘salt of the earth” in a very Canadian sense of it (meet a Newfie and you’ll understand) where the humor is quietly lurking despite an often gruff exterior. But Prudence is not ‘herself’ and is far less energetic and capable than she has been – leaving the management to Earl and his assistant, Seth. For his part, at 21, Seth is working his 12 step programme, listening to heavy metal, full of interesting (and often hilarious observations) while contemplating his next move into the dating world and the questions and anxiety that arises. Lastly, there is pre-teen Sara – she is obsessed (with a capital O) with chickens – and aside from that rather odd quirk and parents who have zero idea how to relate to her, she is also a voice of reason and keen observation – her parents alternate between helicopter style and borderline neglect – leaving Sara to manage her own life, mostly: or scheming her way back to Woefield and her beloved chickens. What emerges between the laughter and imagery here – and some moments with Bertie the sheep and Lucky the mule with his own ‘way’ of accomplishing exactly what HE thinks is needed: is heart. Heart and acceptance, loyalty, friendship and belonging all underpinned with a determination to make a mark and a difference on one another, the farm and the world. Each character finds a moment to shine and contribute to the growth and understanding of the others: each moment of growth is evident, that makes the progression and growth of the group as a whole appear in a way that is natural and organic. Narration for this story is a collective performed by C.S.E. Cooney,‎ Rudy Sanda,‎ Tom Perkins,‎ and Amy Melissa Bentley. Each narrator managed to embody the person presenting their version of the story as it progressed, with clarity and appropriate pauses, emoting and precise timing. While most of the characters are unaware of their ‘humor’ as they speak, there were subtle pauses that allowed the listener a moment to absorb and process that humor, or to reflect on the emotions brought forward. A completely unique and wholly Canadian-feeling sort of story that combined narration, emotion and intention with equal aplomb and leaves listeners smiling. 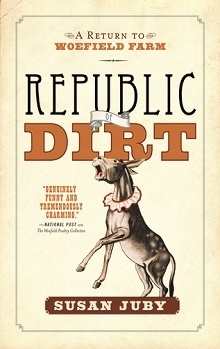 Told in four highly distinct, unforgettably hilarious, and sometimes heartbreaking voices, The Republic of Dirt is about what happens when passions collide with pride and what it takes to save each other, our small part of the planet, and ourselves. Susan Juby is the author of the critically acclaimed Getting the Girl and Another Kind of Cowboy, as well as the bestselling Alice series (Alice, I Think; Miss Smithers; Alice MacLeod, Realist at Last) and her latest novel for adults, The Woefield Poultry Collective. After dropping out of fashion college and attaining a BA from the University of British Columbia, Susan went to work in the book industry. She holds a master’s degree in publishing. She currently lives on Vancouver Island with her husband, James, and their dog, who prefers to remain anonymous.